Picked on January 2, 2015 at 11:15pm EST. The paperback book is already sold out on Amazon. Barnes and Noble still has the paperback book in stock. Are you a book blogger? If you write editorial content about Zuck's books, we'll feature those links on our site. Submit your review. "It's a book that explores how the world is shifting to give individual people more power that was traditionally only held by large governments, militaries and other organizations. The trend towards giving people more power is one I believe in deeply, and I'm looking forward to reading this book and exploring this in more detail." Moisés Naím (born 1952) is a Distinguished Fellow at the Carnegie Endowment for International Peace, an internationally syndicated columnist whose writings are published by leading papers worldwide, and the author of more than 10 books. In 2013, the British magazine Prospect listed Naim as one of the world's leading thinkers. 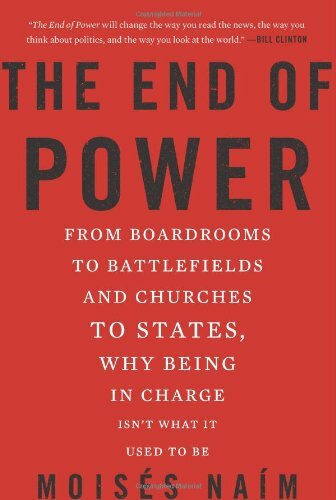 In 2014, Dr. Naím was ranked among the top 100 influential global thought leaders by GDI Gottlieb Duttweiler Institute for work in his latest book, The End of Power. Naim served as the editor in chief of Foreign Policy magazine for 14 years (1996-2010). Since 2011, he has directed and hosted Efecto Naim, a weekly television program on international affairs that airs throughout the Americas on NTN24. In 2010, he received the Ortega y Gasset Prize for his important contribution to journalism in the Spanish language. He is the former Minister of Trade and Industry for Venezuela and Director of its Central Bank and Executive Director of the World Bank.